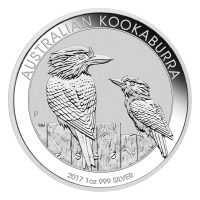 1盎司2017年澳大利亚笑翠鸟银币 Buy the popular Australian Kookaburra silver coin at the best price online. Limited mintage of 500000, we ship worldwide. The reverse features two adult Kookaburras sitting on a fence. The detail on the Kookaburras and the fence they sit on is breathtaking. The design is surrounded by the words "Australian Kookaburra 1 oz 999 Silver 2017" and the Perth mintmark. The Kookaburra has become one of the flagship coins for the Perth Mint over the years and it is easy to see why. With a limited mintage of only 500,000 worldwide these coins always sell out early in the year, secure yours today.